My first activation for the Summits on the Air (SOTA) program was on 3rd March, 2013 at Black Bullock Hill VK5/ SE-016, on the Fleurieu Peninsula, south of Adelaide. Since then I have completed a total of 117 SOTA activations (as of 26th September 2016). SOTA activator certificates are issued at the following levels (those which I have achieved are marked in red. 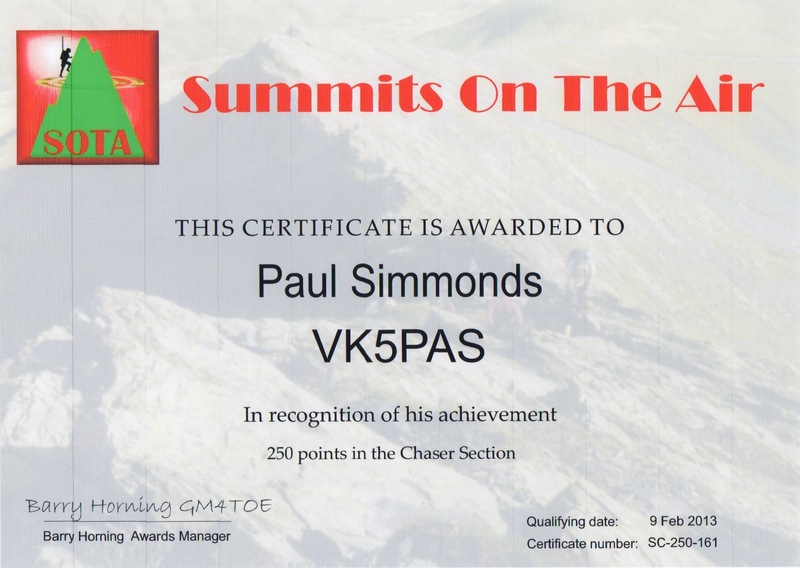 SOTA also issues Summit to Summit (S2S) awards for making contact with other SOTA activators whilst sitting on a hilltop. S2S certificates are issued at the following levels (those which I have achieved are marked in red. I have been an active SOTA chaser since May, when I made my very first SOTA contact with Mike 2012 2Q0YYY on Shining Tor G/ SP-004 in England. In September 2012, I reached ‘Shack Sloth’ level – 1,000 chaser points. On the 30th July 2016 I reached ‘Super Sloth’ level – 10,000 chaser points. I am currently sitting on about 10,204 points (as of 26th September 2016). 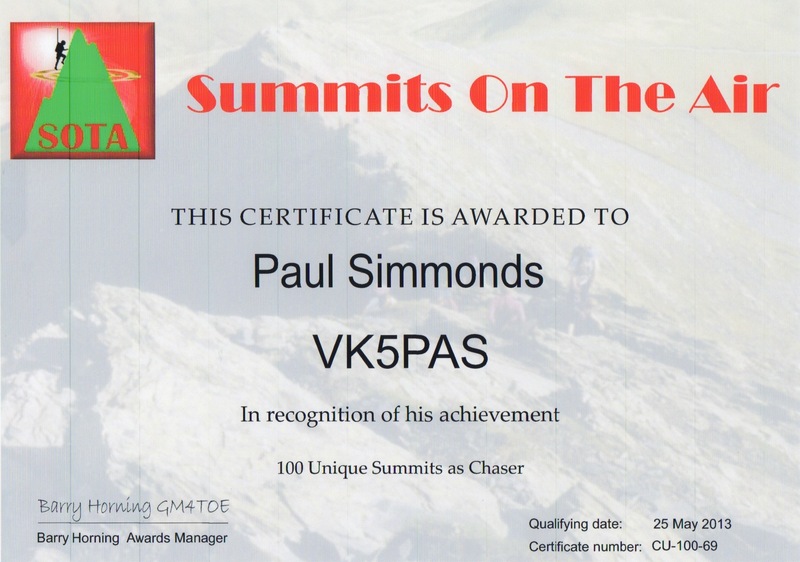 The SOTA Chaser Uniques is a count of the number of different summits in an chaser’s record. It is purely the number of distinct summits chased regardless of SOTA points. I have received the Hunter Uniques 100, 250, and 500. I have worked a total of 737 unique summits (as of 26th September 2016). 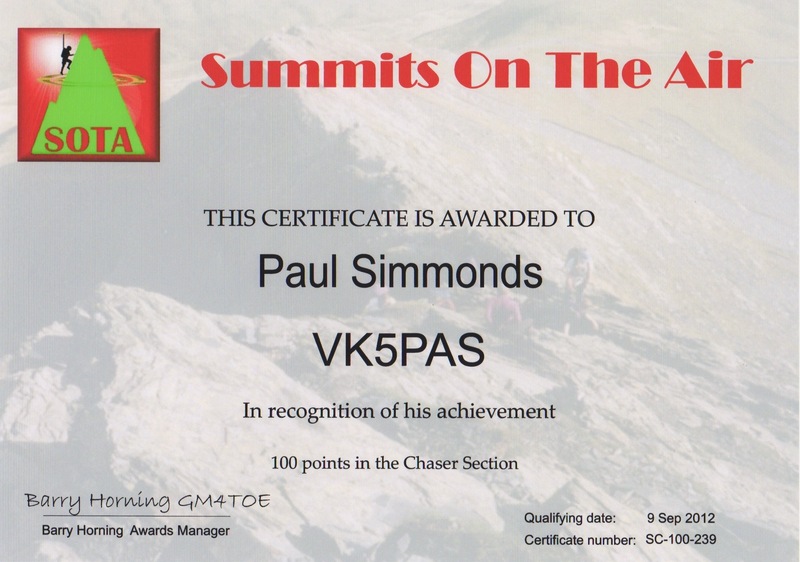 The Mountain Hunter certificate is issued for working at least 2 different summits in each of 5 Associations. I have obtained the Bronze, SIlver, Gold & Platinum Mountain Hunter certificates. Another very interesting website is Summitsbase, who also offer award certificates. There is also the German Mountain Activity Group (GMA). 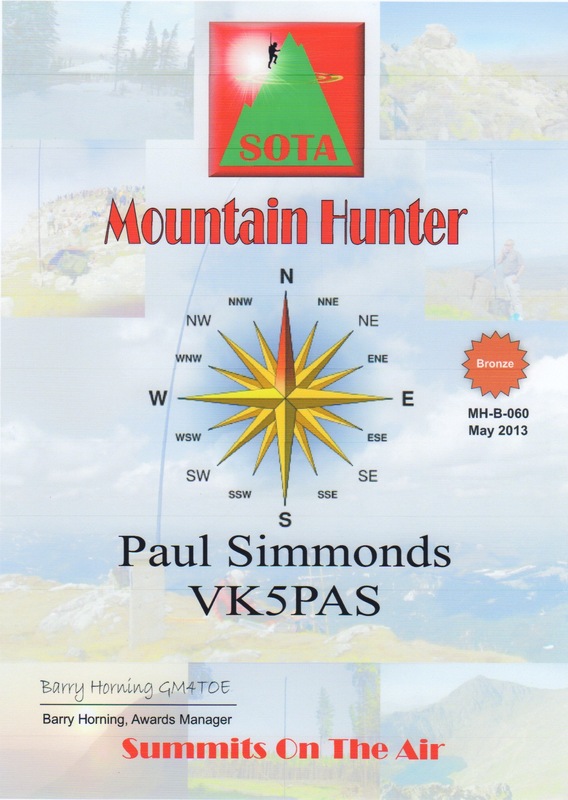 Hi Paul nice looking certificate (Mountain Hunter) award. It looks very good on the web. Thanks for giving me a shout during my trip away. Greatly appreciated. Hope to work you out in a park or on a summit soon.